Leroy’s niece Celestine turned 16 yesterday and, to celebrate, we’ve whisked her away to Malta today, along with the rest of her immediate family. Leroy’s sister Stephanie and her youngest son Valentin came with us to Estonia earlier this year, but the rest of the family hadn’t travelled outside French Guiana before, virtually or otherwise. We couldn’t wait to see their faces as they arrived on the stunning clifftops of Ħad-Dingli before dawn this morning. And we weren’t disappointed. Actually, I thought Romain was about to have a kind of panic attack, but thankfully his desire to appear cool, calm and collected in the presence of his kids overruled any need to collapse on the ground in a quivering heap. The three kids were so excited and completely unfazed by the experience. Dingli (Ħad-Dingli in Maltese) is only 13km from the capital of Valletta, but it may as well be thousands. A cool 13 degrees and wide, star-filled sky overhead, we could have been on another planet for all we knew. As the sun came up, we could see just how high we were; the pale cliffs falling away from the Dingli plateau and the glittering Mediterranean stretching away from us towards Libyan and Tunisian coastlines. Sicily and mainland Italy lay somewhere behind us. Settled around 5200 BC, tiny Malta has been ruled by successive waves of invaders – from the Phoenicians, Romans and Moors to the Spanish, French and English – thanks to its strategic defensive location between Europe, North Africa and the Middle East. It wasn’t until 1964 that it became an independent state and a republic 10 years after that, abolishing all official recognition of the nobility. Farewell, Queen Elizabeth II (and entourage). After aligning itself with Gaddafi‘s Libya and North Korea, and subsequent difficult years of shortages and political unrest, Malta began forging ties with Europe, joining the EU in 2004. As we acclimatised to our surroundings, the nearby woodlands of the Buskett Gardens and adjoining Verdala Palace, one of the official residences of the President of Malta, materialised in the dawn light. But we were there to see the iconic St Mary Magdalene Chapel (pictured above) at the edge of the cliffs. Being Good Friday, I did think there might be a few more people than usual but, while there were some locals, it certainly wasn’t overrun at that early hour. Leroy, being Leroy, engaged some of the men in conversation. Apparently the region’s official motto is Non Segnis Quies Ruris (‘farm solitude is not indolence’). Make of that as you will. 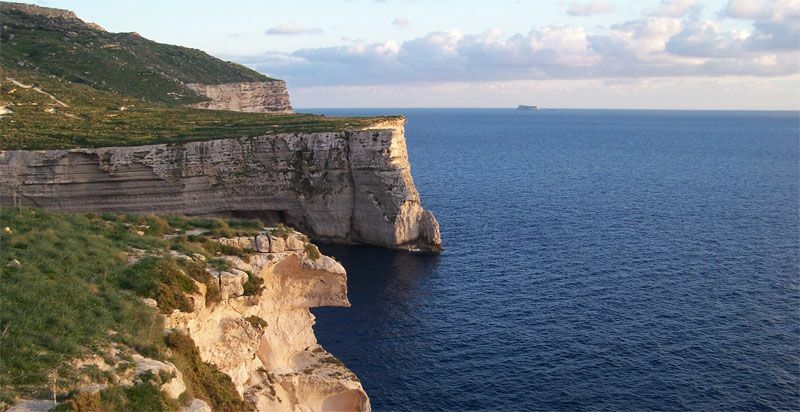 He also discovered that there are tombs carved into the rock near Dingli that date back to Phoenician, Carthaginian and Roman times. And that Roman baths have also been found. Deciding that we might have to return to Malta soon to explore the area more, we then headed to gorgeous Valletta for the rest of the day. Established in the 16th century by the Catholic military order, Order of Knights of the Hospital of Saint John of Jerusalem (‘Order of St John’ for short), the World Heritage-listed city is compact, filled with Baroque architecture and protected by massive stone fortifications. Other buildings are newer, replacing areas of the city bombed during World War II. Perrine and Valentin soon let us know in no uncertain terms that they were starving and we realised we’d have to find some breakfast before any more exploring could be done. Several places were closed for Good Friday, but we found a cafe with outdoor tables on the waterfront and ordered a selection of food with all the associated chaos that entailed. Some of us had ftira, Maltese flatbread, stuffed with tomato, olives and capers. The waiter did his best to convince me to add tuna to mine but I held firm to my non-fish-eating status for another day. 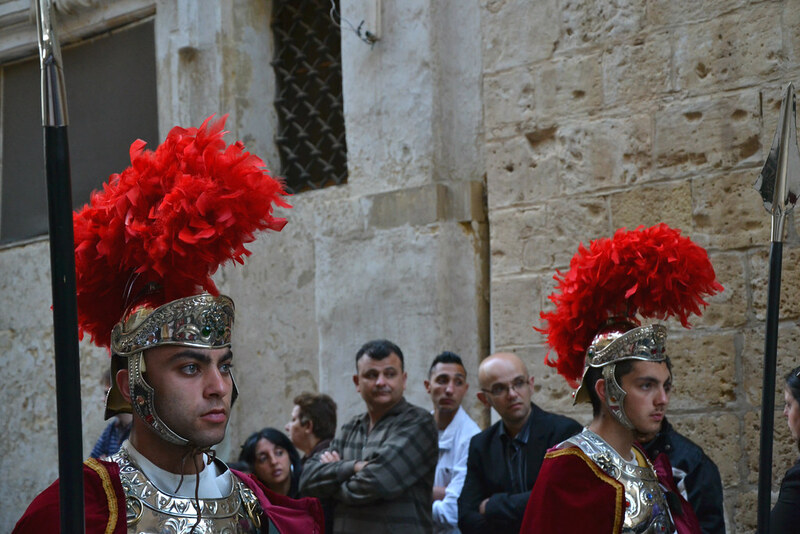 This afternoon we’re going to track down the traditional Easter procession, a solemn affair with participants dressed as biblical characters, others dragging chains or bearing heavy statues through the city. In the meantime, though, we’re planning to wander the streets and soak up the atmosphere of a day that is so obviously special to the Maltese people. When asked what she really wanted to do for her birthday, Celestine said what she has always, always wanted to do is stay in a castle. I’m not sure she ever had any hope of that wish being fulfilled, but Leroy has come up with the goods. He’s keeping it a surprise for the moment, but he managed to track down a 16th century palazzo for the night. Let’s just hope the bill is virtual as well or we’ll be doing the dishes for years to come.